40 Days and 40 Nights! Frank Yamada, president of McCormick Seminary, recently said, “Forty days often represents some weighty symbolic moment in the biblical world.” I’d like to believe, that the survey results provided by Tom and Rita Walters will provide us with a symbolic moment to help us recognize that we need to wake-up to the 21st Century around us and get with it in the area of technology in Catechetics! Figure A summarizes the results of the Spring, 2011 survey. Please look carefully at the findings. This data is real! I’m concerned that we are relying on pre-21st Century methodology with Digital Natives! I’m looking forward to your being part of this conversation. We have been invited to offer our reflections with Tom. I am sharing my reflections with him via this blog. I am inviting you to share in this conversation so that we can share our wisdom with one another as we engage Digital Natives to be engaged in learning and sharing their faith. As I ponder the results, here are my observations. I am inviting you to share your insights and observations. Email appears to be the primary way for parish communications, however recent articles indicate that families are more involved with social media and other communication tools. Tools for parish registration (e.g., Flocknote) are now asking those who register to indicate what mode of communication they prefer – phone, email, texting, social media like FB and so on. Are we listening to what they tell us? Are we comfortable with the tools our students and families are comfortable with? Communication via a static website appears to be the norm (49.2%). Online communication is becoming more and more of a participatory nature. Our models do not necessarily encourage or allow online participation, how do we prepare ourselves to use the mostly free social communication tools to engage our membership in sharing their faith wisdom and news? Unfortunately classroom projectors and the Smartboard are “lumped together”. A projector is a very different tool from a “Smartboard.” I’m wondering – what percentage of religion classrooms are actually using a “Smartboard?” However if the projectors are LCD projectors, with the addition of Smartboards…we still have a small percentage (about 23%) of our religion classrooms beginning to use standard and normal 21st century tools. This would also indicate that few classrooms have little or no access to laptops/computers/tablets or the Internet. Those who have these tools, what are your success stories? Any problems? Online courses could be a major way of teaching and forming our catechetical volunteers and leaders. Instead only 17.5% responded that they have taken online courses which indicates that we still have a long way to go. The resistance to online learning experiences is often rooted in the mindset that F2F learning is superior to online learning. Research tells us otherwise, especially in support of a blended format. Are we ready to teach or learn the faith in a blended format? Do we dare explore webinars, SKYPE presenters, and more at the parish level? Of the social tools, Facebook stands out as a recognized tool for social communication (20%). While NOT a tool appropriate for students younger than 13, the potential of this tool is not always understood by catechetical leadership. Now with the advent of other social tools like Google+, the uniqueness of each tool needs to be understood. The minimum use of blogs, mini-blogs (e.g., Twitter) and Listservs also indicates that our audience is limited in their tech saviness. Research indicates that the unique use of Facebook, Twitter, and a Blog enhances overall communication for a product or service. In the religious marketplace, we need to learn how to utilize these tools to benefit our ministries and overall communication. Do we see the need to do this? Where are the pastoral success stories with these tools? Where is the training? Moodle is a course management system or a learning management system (LMS). 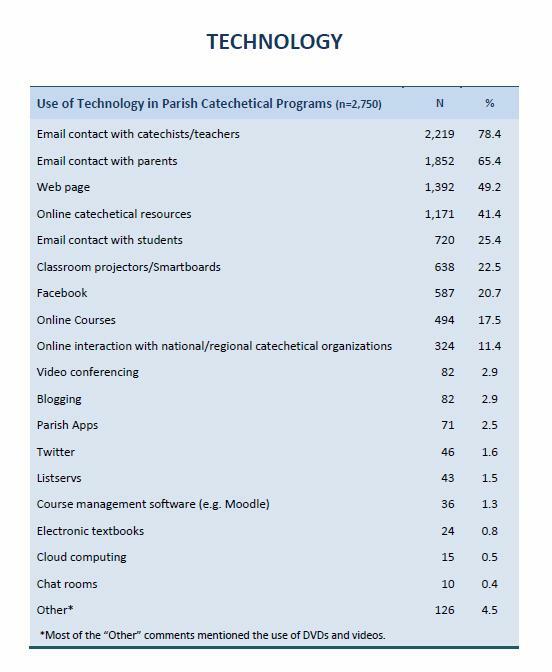 Most of our catechetical personnel have little or no experience in integrating electronic tools into a learning process. Even free tools like “Collaborize Classroom” could be used to enhance student or catechist interaction and online conversation. However, the “technology rich environment” that is needed for these types of tools to be used in a classroom, does not exist at the parish level. If it does exist, it exists in the school setting and is often NOT shared with the religious education/catechetical group. For the Church to become a 21st Century Learning Community, we will need a radically new way to imagine how we do technology in the parish! What we are currently doing today is not bringing us into being a 21st Century Church using new media tools for evangelization and learning. We have yet to learn how to be “Digital Disciples.” What do we need to do to have ministers prepared to teach and evangelize in an online community? Will all ministries (school, religious education, youth ministry, and more) have equal access to the technologies that they need at the parish level? Electronic textbooks are being talked about and demonstrated in various ways. Where this will go is still in the discussion stage. Will textbooks go completely electronic? Some say yes and others say no! I love my Kindle and iPad. And when I’m reading a traditional book – I love that as well. Yet, if and when our publishers create electronic e-books, will WE be ready for this next generation of learning tools? There is more to this than meets the eye! I’d love to hear your comments and perceptions related to these statistics. What questions come to mind? What success stories are currently happening? What issues are we facing in a culture and world that uses electronic tools in a variety of ways to enhance learning? I am inviting you to enter into the conversation!